You know it’s going to be good when the description starts with bright, white and pristine. Oh for the love of monochromatic beauty! 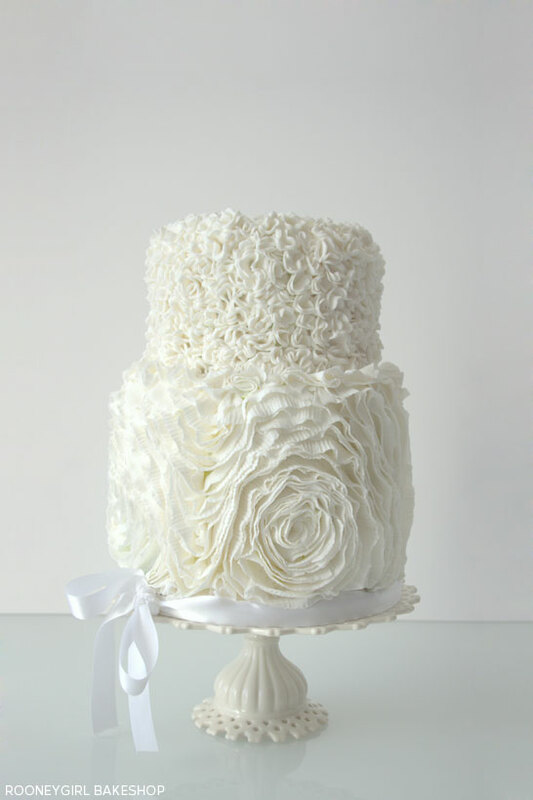 Today’s cake is an elegant design that’s all about the white-on-white texture. Delicate ruffles flow up, down and all around creating swirls of dreamy detail. While clusters of petite pompoms add another layer of wow-inducing character. It’s refined, elegant and just down right stunning. Let’s swoon, shall we? 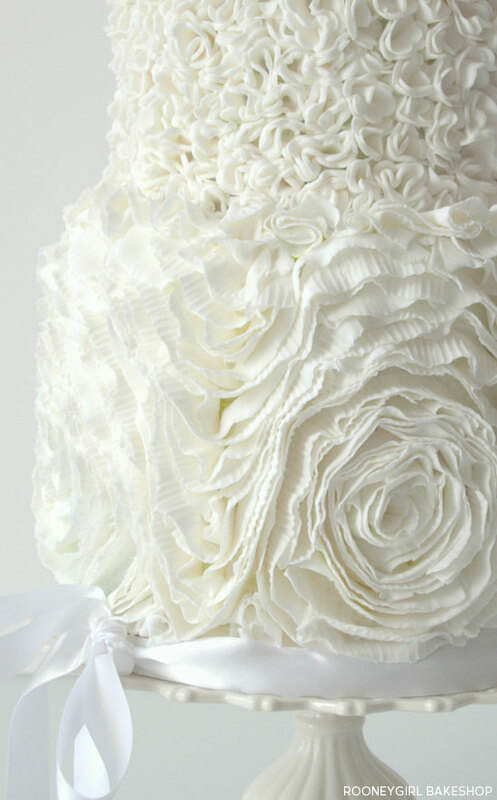 It’s an incredible White on White Ruffles Cake by Maria Nicoletti of RooneyGirl BakeShop. Seriously. Undeniably. Gorgeous! 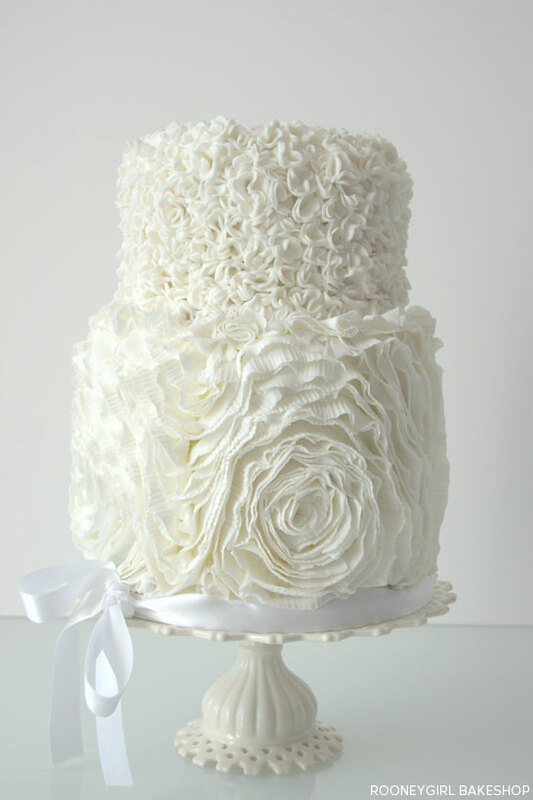 The ruffled rosettes on the bottom tier are crazy beautiful. I love how they gracefully flow from one delicate swirl to the next. If you’ve ever thought an all white cake is boring, this little gem proves otherwise. It brings a touch of charm to any wedding or bridal shower. A special thank you to Maria Nicoletti of RooneyGirl BakeShop for sharing her White on White Ruffles cake with us today. It is simply divine! This is absolutely gorgeous, I can only dream of being able to create something so beautiful one day! Oh my, that must have been a huge amount of work to decorate. The final product is gorgeous. Such a beautiful cake!!! Maria, do you mind if I ask what you used to texture the ruffles? They are absolutely breathtaking. Thank you all for your lovely comments! And especially thank you to Carrie for featuring my cake – definitely my most favorite to date and I’m so thrilled and honored to be on this fabulous blog. Thank you for inspiring us all Maria! Your cake is seriously gorgeous. And thank you for sharing your tips and techniques as well! The intricacy on this cake is amazing. It really makes the cake stand out and show just how much effort and dedication was put into making it. This is so gorgeous. Looks so soft and textured!